The brushes available to you go beyond the default set. 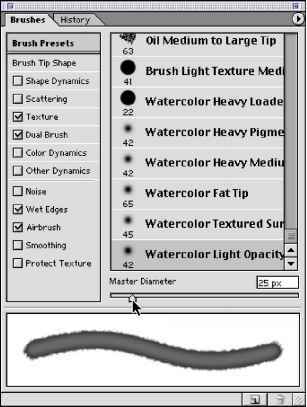 You'll add a new brush library to the brush presets in the Brushes palette, and select settings for one of those brushes. 1 On the Brushes palette menu, choose Large List. Now both the thumbnail of the tip and the name appears for each brush shape. 2 Again on the Brushes palette menu, choose Wet Media Brushes. 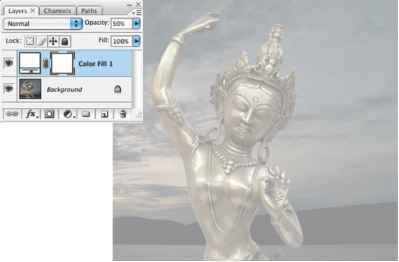 3 A small dialog box appears; select Append to add the Wet Media Brushes library to the set currently listed in the Brushes palette. Note: If you accidentally click OK instead of Append, Photoshop replaces the existing brush set with the Wet Media Brushes set. 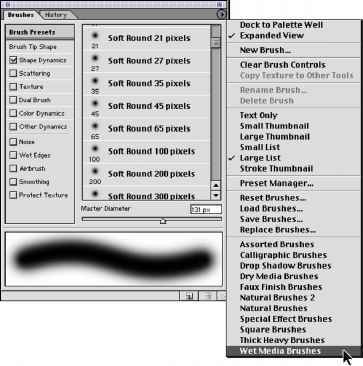 To restore the original brush set, choose Reset Brushes on the Brushes palette menu, and then repeat step 1 to append the Wet Media Brushes to the default brush library. 4 Scroll to the bottom of the list in the Brushes palette, and select the Watercolor Light Opacity brush. Then, just below the list, use the Master Diameter slider or type to set the value at 25 pixels. 5 In the tool options bar, select Normal on the Mode pop-up menu and change the Opacity value to 15%. 6 In the Swatches palette, select the medium blue swatch you created in the previous topic.